And so it begins. The USDA report says #Plant17 is officially underway with three percent of corn planted nationwide as of April 9. That’s one point down from last year, but right on trend with the five year average. Texas, where National Corn Growers Association (NCGA) president Wesley Spurlock farms, is well ahead of both last year and the five year average with 59 percent planted. Four percent of the corn has been planted in Kansas and Kentucky, where this photo was taken, with ten percent in North Carolina, seven percent in Tennessee, and five percent in Missouri. A few state are running behind their averages. 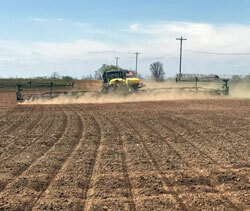 “Wet weather kept farmers from the field for most of the week, but the dryer weather and warmer temps late in the week allowed some field work and fertilizer applications to take place. We will need some more warm and dry weather before we start see widespread fieldwork,” said Iowa Secretary of Agriculture Bill Northey.